Results of the ninth edition of the Test in Proficiency in Korean (TOPIK) language under the Employment Permit System (EPS) have been announced. 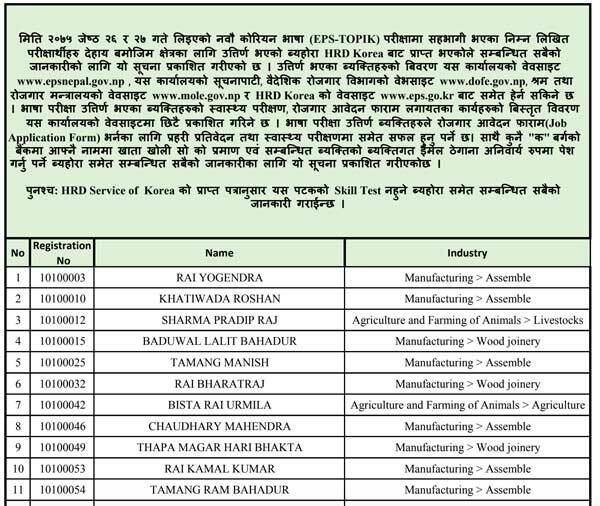 Employment Permit System (EPS) is a program of govt of Korea under which Govt of Nepal sends eligible workers. The examination of 9th EPS-TOPIK was held on Jestha 26 and 27. Of the total 74,866 applicants who appeared in the exam, 7,996 have passed the test as per the results published by the Korean Human Resource Department. The results can be viewed at the homepage of Department of Foreign Employment and also at the website of EPS-Korea section. South Korea happens to be one of the favoured destinations for foreign employment among the migrant Nepali workers. Last year, results of the Employment Permit System-Test of Proficiency in Korean (EPS-TOPIK) was published on 25 July 2017. As many as 12,108 candidates have passed the test required to obtain work permit in South Korea.Of them, around 7,500 had applied in the Agriculture and Farming of Animals stream. HOW TO VIEW 9th EPS-TOPIK Results ! Click here to see the complete name list (Full Results ).